If you are looking for the very best in marine art, you have found it here. Available as a print, on canvas for the look and feel of the real thing, signed, numbered, from this web site Print Galley. She made her last commercial voyage from London to Lisbon in 1921 with scrap iron. A salty yarn, I worked at Falmouth as a photographer, learnt ship and boat building at Falmouth Technical College and sailed out of that port many times for five happy years and subsequently when visiting friends. During that time I discovered and added to a collection some rare old photographs of Cutty Sark being restored at Falmouth. This and other paintings were part of the result of that discovery. 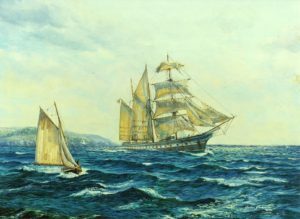 The beautifully evocative “Last Departure” painting was for several years honoured to be on display on-board “Cutty Sark“, at the invitation of her then Captain, Simon Waite. Incidentally, for many years the masters of Cutty Sark at Greenwich were master mariners, retired British India Steam Navigation Company captains as were many of the other officers aboard her. Besides liking the painting Captain Waite had noticed the ship was ‘spot on’. Simon said even the currents of Falmouth Bay and the Falmouth Working Boat (an oyster dredger) were correctly portrayed for the period, and noticing I’d remembered the bell on the lighthouse, the bell has since been removed. The currents, the working boat and the background were right in part thanks to my Cornish friend Patrick Selman a fine traditional sail maker who built his own working boat ‘Agnes‘. For this painting, Pat took me out into the bay to check details. 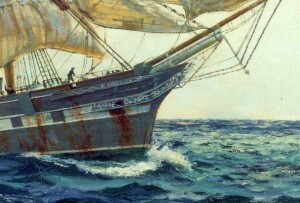 Captain Waite wanted “Last Departure” bought for Cutty Sark. 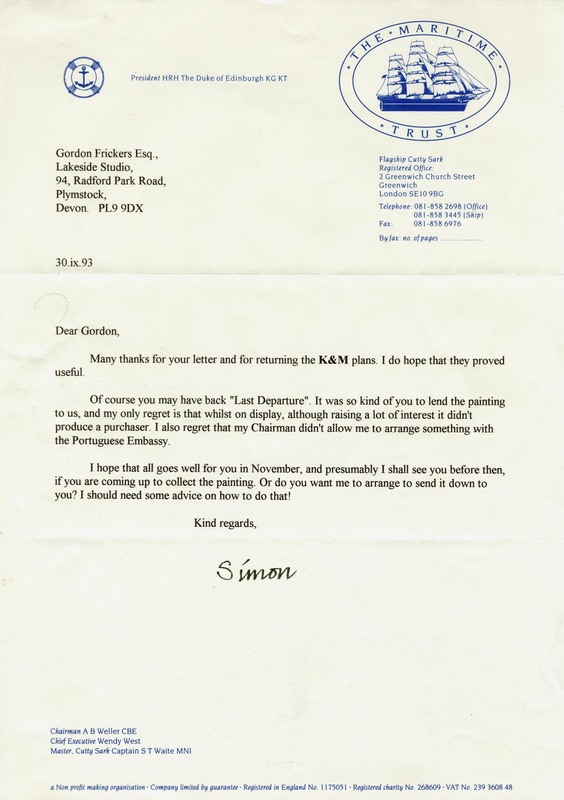 Alas that was not to be, the trustees and the National Maritime Museum said no, missed their opportunity. Maybe just as well, the painting might have perished when the beautiful Cutty Sark was negligently badly burnt. This most celebrated of tea clippers was after she was sold out of British ownership for more than half of her sea going career known as “Ferreira“. For 28 years the ex Cutty Sark had sailed as “Ferreira“, Portuguese owned, engine-less to the end. 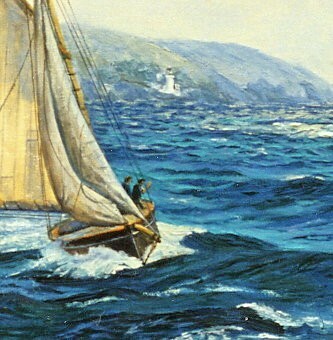 She lost her original square rig in a storm off Cape Town (1912?). She was ‘self repaired’ meaning her own crew put her back to sea. She was much loved by her crew who claimed she leaked not one drop to the end. In 1921 storm damaged again this time in the English Channel, in distress she put into Falmouth where she was repaired by her own crew. The famous old clipper retained beneath old paint and sea grim her elegant lines, evidence of past glories. Battered and distressed by age she still attracted hundreds of visitors. As her working life drew to a close Cutty Sark was put up for sale. Captain and Mrs Dowman who had retired to Cornwall, saw and visited her when she put into Falmouth in 1921. When a young man Dowman had seen Cutty Sark in her ‘glory bee!’ days under full sail storming up the English Channel and thought one day to buy the magnificent clipper. The Dowman’s had already tried to buy the old lady but when the owners discovered they were English an exorbitant price was demanded. 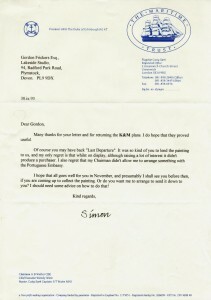 The ship’s visit to Falmouth resulted in a second attempt to buy Cutty Sark, this time via a Portuguese agent. Purchased, the old clipper was towed to Famouth by the steam tug Triton and restored in one of the dry docks for use as a training ship. She never set square sails in earnest again but besides youth training was used at Falmouth and Fowey as a [popular] regatta Committee boat. She set fore and aft sails for the last time off the white cliffs of Dover while being towed to Greenwich, London were you can to this day visit and go aboard her. Do take a visit to Greenwich; besides the charming village and Cutty Sark, you can visit the unrivalled British National Maritime Museum the world’s largest maritime museum, filled with inspirational stories of exploration and endeavour at sea. A brief walk away you can stand on the Greenwich meridian line, stroll in the park and visit the seaman’s hospitals. Together this makes for an unforgettable day out particularly if you arrive via the river boat from the Tower of London. My son Graham, a new Helmsman for Cutty Sark? 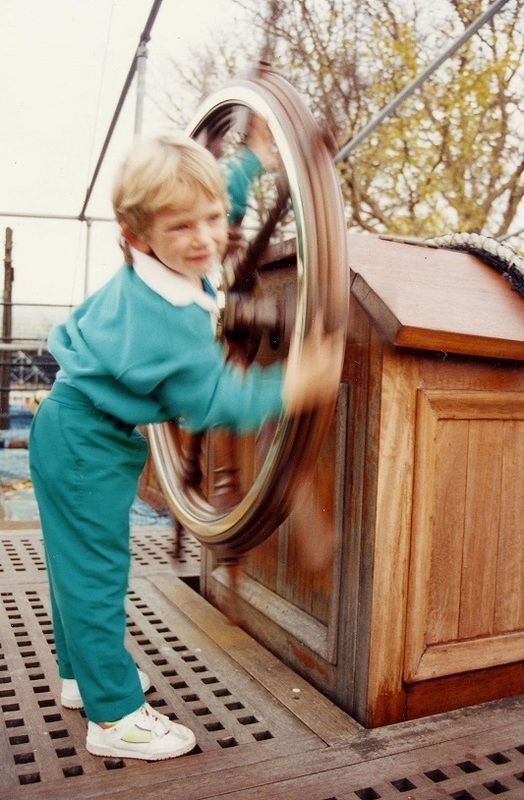 I first encountered Cutty Sark as a child aged about 7 on a school outing with Brabourne Rise Preparatory School. Many years later I made sure my children experienced London and visited Cutty Sark. Built on the River Clyde in 1869 for the Willis Shipping Line, Cutty Sark was and still is a British clipper ship. In her day, tea was a very valuable cargo. The first ships home with the new season’s tea earned for their owners and crew a worth premium. This is the origin of the term ‘Premium Tea‘, a label still used today to denote the finest quality tea. Produced near the end of a long period of design development, she was one of the last tea clippers to be built and without doubt one of the fastest in any weather. The opening of the Suez Canal halted tea clipper building as sailing ships gave way to steam propulsion. Your best source of further information, “The Log of the Cutty Sark” by Basil Greenhill or ask Gordon Frickers.